Property here in Dubai is a big deal, everywhere you look there are cranes and in the middle of the Malls developers have spent a small fortune placing a stand with a 3D model of their latest development. The Emirate is looking to position itself as the financial safe haven of the Middle East and with that, they know, comes a solid property market. 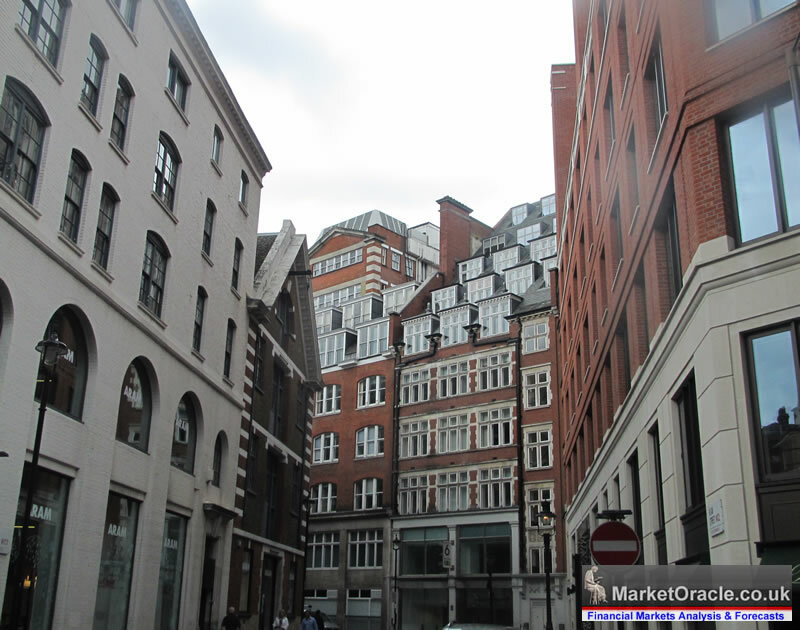 London property has long been the poster child for countries such as the UAE who are looking to develop what has for a while appeared to be an indestructible real estate market. Since 2011 London house prices have climbed by 65%. Between 2006 and 2016, average house prices in the capital grew from £257,000 to £474,000 or by a very substantial 84.4%. These large gains were ‘built’ on the back of the very large appreciation that was seen in prices between 1996 and 2006 (see chart below). 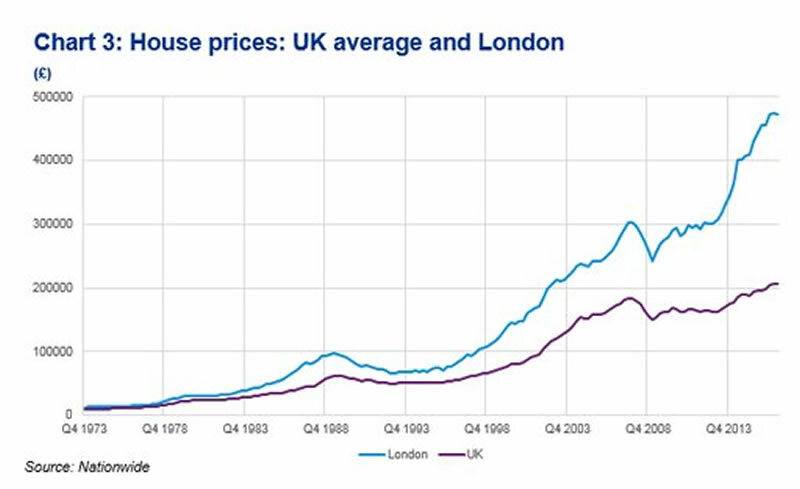 Average house prices in London in 1997 were below £85,000 meaning that in 20 years prices have risen over 450%. This has created an air around the city’s property markets – residential and commercial – that they are invincible and that they are a safe haven. But London property values might not be as invincible as the world thinks. UK’s Land Registry data for three London boroughs shows transaction volumes in London — the number of houses being bought and sold — are at an all-time low. Back in December asking prices in London dropped 4.3% in December with inner London down 6%, more exclusive areas dropped by as much as 10%. The slump continued into the first quarter this year, a survey by the Royal Institution of Chartered Surveyors found that more agents than not reported price drops in March. London is now one of the five-slowest growing cities in the UK. London property has for some time had many of the signs of a bubble. However, it is always very hard to pinpoint when a bubble might burst. We are certainly seeing signs that the overheated market is beginning to cool. Of course, all ‘good’ things must come to an end, but what is driving this particular scenario? In a world of uncertainty what is tipping which scale can be confusing, but there are some factors at play here that are most likely responsible for the downturn we are witnessing. Does a downturn or bursting of the London property market matter for the wider UK, or the world? Certainly, as with previous bubble bursts, these things are mere tips of much more dangerous icebergs. Is the market even affordable? 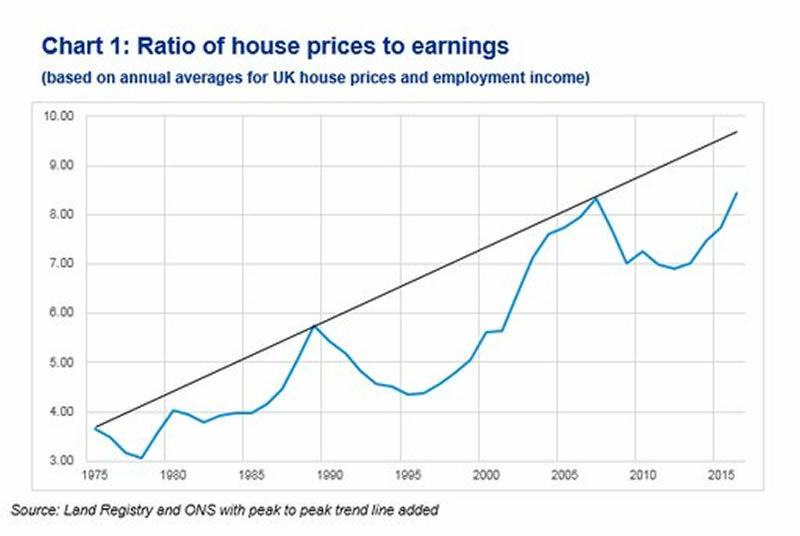 While KPMG’s research suggests that the house-price-to-earnings ratio is currently below the peak-to-peak trend, it is concerning that it has reached now back at all time record highs. So as long as interest rates stay ultra ultra low, new borrowing could keep the property market going and keep UK house prices buoyant at least for a while longer. Since 2013 the average value of London property has risen rapidly relative to rents. For first time buyers and working immigrants the decision to buy comes down to rent prices versus the cost of borrowing, this drives house prices. So when buyers are optimistic about future house prices, they are generally happy to cover more expensive interest rate payments over rent, if they expect to see a return. This, combined with dinner party conversation over the infallibility in the London housing market, pushes buyers to buy property today terrified in the belief that prices will only get higher. If record high rents begin to fall – which seems probable given the many global geo-political, financial and economic risks and indeed the risks posed by Brexit to the UK economy – then first time buyers and indeed buy to let investors might decide to hold off buying. Also, as earnings are not increasing in line with ether inflation or house prices, factors such as Brexit and interest rates (both of which are wrapped up in uncertainty) are beginning to cast a shadow over the London property market. Something which could be disastrous for the UK economy. During the UK’s EU referendum, there were lots of on-the-street interviews with voters arguing that a post-Brexit world would impact the country’s property market. Post-Referendum we are still in a weird limbo as we await to see the result of Brexit negotiations. In the meantime the rest of world’s financial markets and investors speculate over various uncertainties. This in turn will inevitably impact real estate prices. The most immediate data we have that shows the impact of Brexit is the slowing of immigration into the UK by those looking to study or work. This was the case even in the run up to the referendum. This fact is one of the contributors to the cooling off in London house prices. There is a slow-down in demand for not only property to buy but also to rent. Potential buy-to-let purchasers are seeing a slow-down in demand, which reduces the return on their investments. But international investors (as opposed to immigrants) might not be put off just yet by the London property market. To those holding US dollars or euro, the capital’s real estate might seem to be quite the bargain. In dollar terms property is 16% cheaper 11% so for euro buyers than they were before the referendum due to the sharp fall in sterling. Providing they are comfortable with the considerable currency risk. As was seen over the weekend and still very high tensions between the May government and the EU, Brexit uncertainties are set to continue. It is the impact of these, and likely further weakening in the pound, which may create further issues for the UK economy. Is Brexit really an issue? There is no doubt that Brexit has created some uncertainty in the UK housing market. The recent property prices speak for themselves. Should the Conservatives win the majority in the June election there could be less uncertainty although the negotiations with the EU are likely to be long and hard. There is no guarantee that they will be successfully wound up in even two years time and there is the real risk that they lead to a significant deterioration in relations between the UK and EU powers and leading EU nations. A bigger concern for the UK housing market is interest rates. The cost of borrowing has been at record lows for several years. Central banks’ easy money policies, including the Bank of England, have meant that we have seen property prices increase around the world. The era of record low interest rates was always going to come to an end and the finale is now on the horizon. The Bank of England warned back in February that the post-Brexit value of the sterling which is expected to send inflation to 2.7% this year, will prompt a hike in interest-rates. If it costs more for buyers to borrow money then this quite simply means that there is less money to be spent on property. The market is already built on the sandy foundations of massive debt suggesting that this is a house of cards that can’t take another layer. Even where there is real money playing a role, the amount required for a deposit is rapidly becoming unobtainable. First-time buyers are dropping like flies given the increase in deposit amounts; first-time buyer deposits have reached £34,000 across the UK, and nearly £100,000 in London. In the last few years buyers (both property investors and first-time buyers) have been enjoying the merry-dance of borrow money at a low yield and spending it on the higher-yielding property market. And this isn’t just happening in London, it is happening across the global property market. The dance has been going on for some time, but it looks as though the jig is about to come to an end, soon these same savvy investors might find themselves with an expensive lump of debt to service, a falling yield on rents and an asset which is worth far less than they had expected. A problem only to be borne by foreign investors? Back in January Catherine Mann, the OECD’s chief economist, spoke of vulnerabilities in asset markets. In regard to the UK property market she said this would be good for the country if the fall in prices was borne by foreign investors. However, it is next to impossible that the UK will not feel the pain of the property bubble bursting. Aside from those buyers who will likely be left facing negative equity, unserviceable levels of debt and possible bankruptcy we also need to consider the impact of those who are still borrowing to buy property. Local councils in the UK aren’t known for their investing prowess. You just need to look at the Icelandic banking scandal that resulted in UK council being bailed out, for an example. This time around the councils have decided that their local property markets are ones worthy of a punt or two. They may well have been witnessing the optimism that remains amongst estate agents, with more respondents to the RICS survey than not saying they expect prices to climb in the next year. Councils overextending themselves (as we saw with Iceland) is not a cost that is later borne by foreign investors. It is borne by those who have to bail them out – the tax payer. We have been here before. The RICS Chief Economist referred to the ‘flat trend in transaction levels.’ We can spend as much time as we want referring to buyers’ deposits, cost of borrowing and the impact of Brexit but we only do so in reference to demand. This over-heated market was also driven by levels of supply. A small drop in prices, at levels mentioned in the beginning, means that supply is also likely to slow-down as owners fear they won’t get much return on their investment if they sell now, instead hoping to sit it out and wait for a correction. Hometrack data shows supply is not keeping pace with sales in Birmingham and Manchester, despite prices set to increase. In London, a stall in prices is more or less inevitable as buyers aren’t purchasing houses at the same rate they’re being put on the market. A brief check on a major property website by ZeroHedge found that there might be call for nervousness among sellers and estate agents. Despite discounts on Kensington and Chelsea properties by as much as 40% on those that have been listed for over a year, the number of listings appears to have doubled and little seems to be shifting. Since the Second World War, UK house prices have only crashed three times, the second time was just ten years ago, then again in 2009 when they hit rock bottom. Since 2013 they have been unstoppable, especially in London. The belief that they are unstoppable comes from the same drunken optimism the credit crisis came from – one of immortality and the mass delusion at nothing could threaten the property boom we were seeing. Data is now slowly revealing a different picture from the one so many people have been imagining for the last few years. The property market is certainly seeing a serious cooling down and the question is whether this is the start of serious correction or a crash. This is not just an event that will be kept local to London. Other “international cities” and major property markets such as Singapore and New York looks bubbly and vulnerable to sharp corrections. Now would be a pertinent time for investors to review their portfolio allocation to property markets. Even if you do not hold property other than your own home, the bursting of the bubble will no doubt impact the global financial system, not to mention the national economies to which they are so intrinsically tied. If property market corrects sharply or crashes, companies, councils and irresponsible lenders will need to be bailed out. Who will be footing the bill? We will. For reasons already explained by events played out during the financial crisis, it would be prudent for readers to consider how much exposure they have to not only the property market but also the banking system and the banks that have considerable exposures to property markets. It is difficult to hedge property investments effectively. 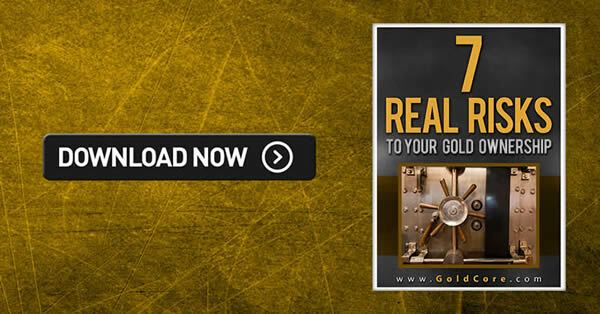 However, in our modern globalised world where interest rates and economic cycles are increasingly correlated, gold will likely become an excellent hedge for property investors in the coming years. Property prices look over valued in many markets internationally today and in the event of price falls, gold is likely to act as a hedge and preserve wealth as it has done throughout history. Investors should decide on a reasonable allocation to gold bullion, held in allocated and segregated storage in less debt laden jurisdictions. Owning these assets outside of the digital and the financial system, away from the shaky, debt-fuelled banking system funding the overheated property markets will soon be seen as prudent.